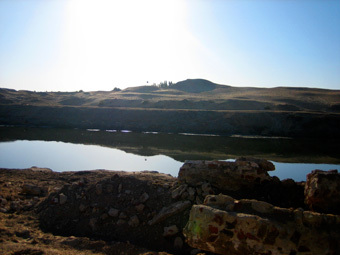 One sunny morning I set off for the site of Kom Abu Bello (the mound of Abu Bello) in the Nile Delta. 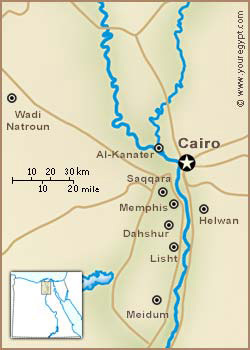 Getting there meant driving in a 4x4 for about 75km along unmade cross-country roads northwest of Cairo. I was interested in exploring this rather neglected site because it is a junction on a forgotten route that was once very important. This road used to link the lakes of Wadi el Natron in the west to the branch of the Nile leading past Abu Bello to Rosetta, and on the other side, to the east, it ran alongside an ancient canal that connected with the part of the delta north of Lake Timsah, and on to Sinai. Let's not forget that in 1799 Napoleon and his engineers discovered an east-west canal that crossed the delta via Bubastis, Pi-Ramses and Phitom, among other places. The site of Abu Bello from the west. (Photo Gigal) Map from Napoleon's expedition indicating Abu Bello (Abou Bellou). Why is this meeting place of Abu Bello so important? Simply because, according to my research, it connects two worlds that are very rich and very different. First, because in ancient times, to the west the whitish deposits of the lakes at Wadi el Natron, which evaporated in the summer, were mined for natron, a substance made of sodium carbonate. This had many uses: in medicine, for preservation and mummification, for the purification of places, and also for preserving meat, treating hides and bleaching laundry. So it was a highly valued product, indispensable in the daily life of ancient Egyptians. In the Roman period, natron became an important ingredient in glass-making, acting as a stabilizer to lower the temperature of the silica. 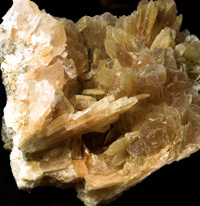 Even today, small amounts of halite (i.e. table salt) are still extracted from Wadi el Natron. To the east of Abu Bello there is a long road that leads straight into the Sinai. What is interesting is that in the pharaonic era Abu Bello was called "Mefkat", i.e. "turquoise". In those days the whole production of turquoise came from Sinai (six mines) and especially the celebrated mines of Serabit el-Khadim. The Sinai was even called "the land of turquoise". Turquoise was used from the earliest pharaonic dynasties. 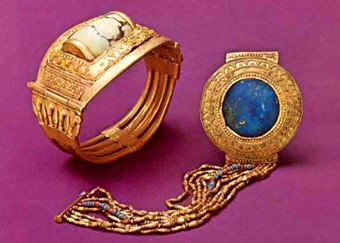 When the tomb of the Egyptian Queen Zer (5500 BC) was excavated in 1900, she had on her wrist a bracelet of gold and turquoise. Mefkat is also a noun that means "joy" and "delight". The west branch of the Nile north of Al Kanater going to Rosetta. So I think I'm right in saying that Abu Bello is an important link between the production of natron and of glass in one direction and of turquoise in the other. Even more so because it was a connecting point between the two systems of production and the two geographical areas, since copper pigments derived from turquoise ore were sometimes used along with silica and natron to make turquoise-coloured glass, the famous "Egyptian blue". Natron crystals. Bracelets with turquoise from Tutankhamen's grave goods. During the Greco-Roman era Mefkat was called Terenuthis, from the ancient Egyptian ta rennouti, i.e. "land of the goddess Renenutet". Evidently Abu Bello was a cult centre of the mysterious cobra-headed goddess Renenutet, who personified sophisticated sacred principles. Renenutet was known for her presence above the shoulders of the newborn from its first day, and through the breast milk she gave the infant a protective secret name, their ren, or "true name at birth", something that was considered a vital part of the soul. At the same time she personified harvests and fertility in her role as serpent-nurse and "Lady of Fertile Fields," and she was therefore associated with luck and good fortune. A lesser known aspect of the goddess is that she was the mother of Nehebka, who was the deification of the principle of union between the Ba and the Ka after death. Thus she presided over births, and her son was a guardian in the next world who ensured the safe return of the Ba to the Ka. 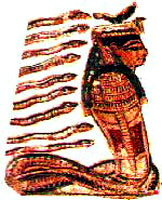 She was also associated with the serpent god Shai, symbol of destiny. In Coptic, Mefkat was known as Terenuti, origin of the modern name of the town near the site, Tarrana. Abu Bello, the name of the entire archaeological site, comes from the name of the Greek temple of Apollo that once stood in the northeast corner of the area. 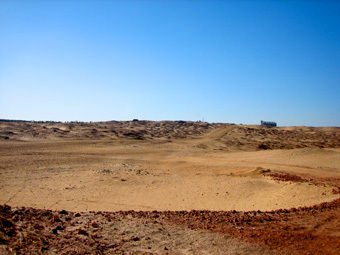 The site was excavated by the British Egyptologist Francis Llewellyn Griffith (1862-1934) in 1887-89 but he was unable then to make a complete plan of the remaining ruins and the site; I soon realised why, as you will see a little further on. In any case he recorded the remains of a temple dedicated to Hathor, "Mistress of Turquoise", with elegant bas-reliefs dating to the time of the Ptolemies (I and II mainly). Hathor at Abu Bello, bas-relief, Bolton Museum. 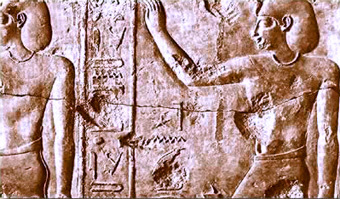 Pharaoh Ptolemy I offering a greeting, bas-relief, Abu Bello. 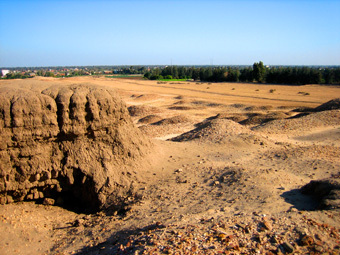 Later a large cemetery was found containing thousands of tombs, including burials from the Old Kingdom (6th Dynasty, 2345 BC) and graves up to the 4thC AD. Most of the graves are in brick with a rectangular or square superstructure and vaulted roof, though some are shaped like truncated pyramids. 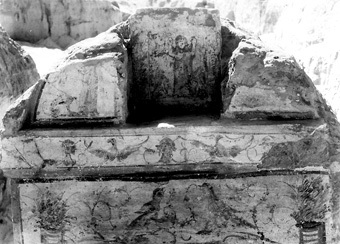 Some Philistine tombs with strange decorations were also found, along with New Kingdom sarcophagi roughly decorated with a very unusual type of stela, the "Therenutis stelae", depicting the deceased reclining on a couch or with both arms raised, between two columns, with text in demotic or in Greek. One of these inscriptions, that of Atilon and his family (3rdC AD), is now in the Louvre. It depicts Atilon lying on his couch, protected by Anubis and the Horus hawk, but not in an Egyptian style. It was found that offerings of wine, lettuce and grapes were placed on tables for the dead. We also know that lamps were lit and music was played. Philistine tomb of Isidora, 14 years old, daughter of Hermaios (200 AD). You can see the image of the girl with her arms raised. Much later, between 1969 and 1974, the site was excavated during the construction of the Nasser canal (nothing to do with the Suez Canal) that still flows majestically through the site. An urgent rescue plan for the site was then established. Among many subsequent finds were faience statues of Anubis, Isis, Taweret and Bes with hieroglyphic inscriptions, stone blocks bearing the name of Ramses II, and pottery lamps with drawings of olive branches, of Heket the frog-goddess, and of river fish. Lots of earrings were found in gold and silver, bracelets, rings, hair clips, ivory combs, and a large number of amulets, along with numerous pots and amphorae of all kinds. 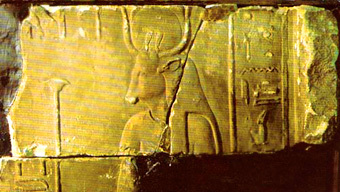 The graves of animals associated with the cult of Hathor were also discovered. It is important to note that the full title of Mefkat was "Per Hathor nbt Mefkat", or "the House of Hathor, Lady of Turquoise", which underlines once more the connection with Sinai. Hathor was associated not only with fertility, vegetation, flux, the Milky Way, joy, love and music, but also with the very old cobra goddess Wadjet, protector of the whole of Egypt and of the Pharaohs, similar to Renenutet. The name "Wadjet" means "blue-green", ie. turquoise. During the drive I was turning all this over in my mind and wondering what I would actually find in Abu Bello after so many years without any activity on the site. I was driving alongside the Nasser canal when suddenly on the far (west) side I noticed, beyond the long stretch of fertile fields, a rise of higher ground covered with hundreds of dunes, a wide, sandy area rising to the horizon - I knew that was it. And crossing the narrow bridge over the canal, I arrived at the site. Though I was expecting yet another neglected site, completely flat and ruined and hardly showing a sign on the ground, reduced to almost nothing after being buried for years, I found an enormous site of several km2, in an a semi-circle covering several mounds! I soon saw that the ruins were not vague traces of walls hardly visible above ground level, but entire rooms with upper storeys completely obscured by mountains of sand or earth! Leaving the 4x4 on a sloping oval area that I thought could have been the site of an ancient sacred lake, I began slowly to make my way uphill in a fresh breeze. The first thing that struck me was the ground. It was literally smothered in a dense layer thick with millions of fragments of all kinds of pottery and semi-precious stones. The closer I got to the hundreds of small dunes at the top, the more I realized they were hiding complete structures, rooms and small temples, though all except two small buildings were almost buried in sand. 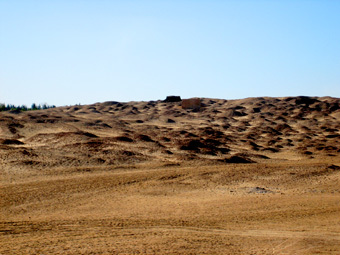 Since it is beside a branch of the Nile going from the south to the Mediterranean, the site is in a wind corridor where the winds can pile up enormous layers of sand and are constantly changing the appearance of the landscape. 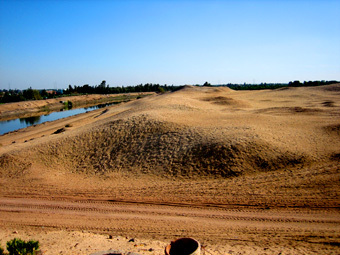 I understood why the discoverers of the site were not able to draw up a complete site plan; to do so they would have had to spend several months moving tons of sand! The site of Abu Bello seen arriving from the other shore After crossing the canal we can see the structures still under the sand along it. As I go, I'm constantly tripping over pots from the Ptolemaic era, some still whole, and have to constantly watch my step - the ground is covered in them, proving beyond doubt that an enormous number of people once lived here. I approach the small Ptolemaic rectangular building. Sadly it is covered in graffiti and the inside is ruined, but still I see it has a vaulted ceiling with an opening to let in the light, like the temple of Seti at Abydos. Just behind it there is another older brick structure, probably a storehouse, with several openings including arched doorways, but too buried to see properly. All around me as far as my eye can see, almost all the mounds contain whole buildings, revealed by slabs of walling and corners showing above ground level. It is essential for professional teams to come and excavate all this and reveal these treasures because the site is really impressive and beautiful. Unfortunately it will mean digging deep to find traces of the Middle Kingdom and Old Kingdom, there is so much sand and soil, but I am sure that, given the vast extent of this site at the intersection of these important roads, many surprises await those who have the courage to tackle the task. The ancient place of a lake to day vanished, where I stopped. Thousands of little dunes hiding secrets. I got back in the car to cross the canal, because on the other east side (don't forget that the Nasser canal is modern so in the old days the concept of the west or east bank did not exist - the entire site is situated west of the branch of the Nile) there were still the cemetery and the ruins of some houses from several different periods for me to explore. On this side of the canal the atmosphere is strange; silence reigns and the mounds of potsherds, broken pots and small decorative stones are even thicker. My progress through the ruins was hindered by dense thorny bushes and a few snakes, unaccustomed to a human presence. But after a while scattered red granite columns, fallen capitals, blocks of stone and flights of steps, more or less buried in the ground, revealed themselves to me. One whole section was not really a cemetery and an intense life had gone on there, but to reveal it would require clearing away a huge area. To the north of the site I came to some strange brick tombs, shaped like pyramids; sadly they are in a very poor state but you can still see the incredible thickness of the walls, some of which are more than 4m high. I also saw in the distance a thick brick wall, some of it collapsed to ground level, that seems to surround the entire site. As I was leaving, a surprise was waiting for me. On a heap of pottery fragments a shiny flash of white caught my eye, a large chunk of mother of pearl. On this piece, which must have been part of a very big shell, is engraved a pharaonic seal from the New Kingdom. 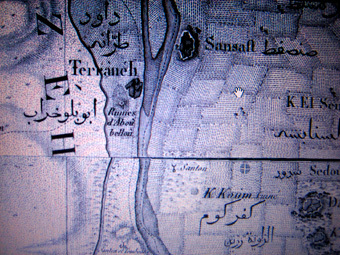 This was definite proof, or at least a convincing clue, that there was intensive trade in one direction between the Mediterranean and the lakes of northwest, and in the other along the old canals, connecting the various branches of the Nile and extending north to Lake Timsah, a navigable route that eventually reached the Red Sea. I made my way back to Cairo deep in thought, thinking how fascinating it would be in the future to excavate in this powerful place. This is something the Egyptians have promised me they will do, and it is already scheduled in their plans for future work.